Philadelphia Vireo, I noticed more than ever this fall. Sometimes we see nighthawks passing over during the evening. The Great Cormorant population breeding in mid coast Maine has been declining for 20 years, there were 260 nests counted in ’92 that number has been reduced to less than 50 pairs this year. 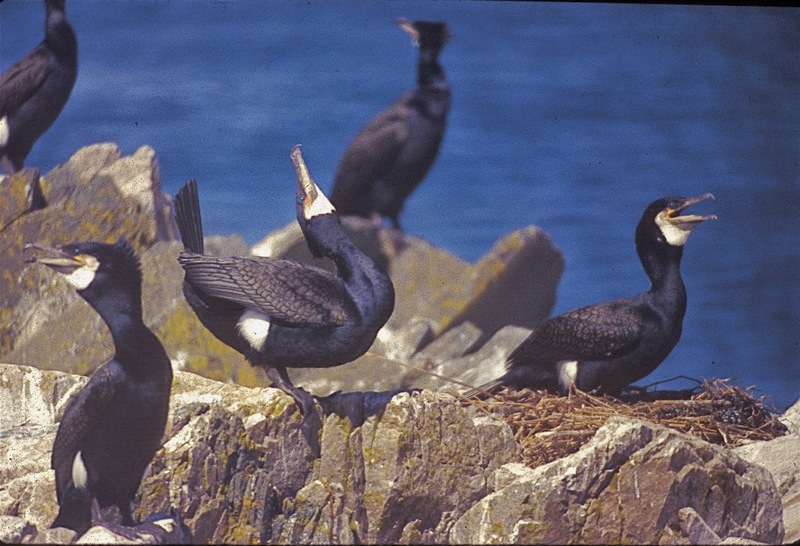 This breeding Great Cormorant population is a wildlife resource unique to Maine among our fifty states. Great Cormorants are elegant, admirable birds the same species that has been harnessed by some Asian cultures, and formerly in parts of Europe as a means to gather fish. In 1834 Thomas Nuttall wrote of this species “they breed and are seen in the vicinity of Boston on bare and rocky islands nearly throughout the year”. Great Cormorants were extirpated as a breeding bird from New England during the 1800s. In 1922 Charles Townsend speculated that the species was “Probably now extirpated as a breeding bird from North America”. Apparently Anticosti Island in the Gulf of the Saint Lawrence provided a refuge for this species on this continent. The expansion of the North American Great Cormorant population during the thirties was such that Alfred Gross anticipated their re-colonization of the Maine coast, In 1944 he wrote, “As yet I have no evidence of Great Cormorants nesting in New England, but since there is a possibility that they will continue to extend their breeding range, it is important that we be on the watch for their nesting on the islands of the Maine coast”. The first documentation of the reestablishment of a breeding population in Maine was in 1983 when 44 nests were counted at three sites just east of Isle Au Haut. The Population grew until 1992 when there were 260 nests counted at 7 sites. These Great Cormorants chose the same region as did Double-crested Cormorants when they re-established a breeding population in Maine during the 1920’s. Two Great Cormorant and a Double-crested Cormorant. Many Eagles have become adept at reaping seabirds. Gangs of mostly young eagles living on the coast have had Eiders, Gulls and Cormorants to sustain them through the summer. The young of the year are the easiest ones to catch so the Eagles usually catch them first. Eagles have driven gulls from islands where hundreds of pairs recently nested. When the young gulls start to fledge they are vulnerable, when there are two thousand vulnerable near fledging herring gulls concentrated on 20 acres this makes for great foraging for young eagles. The Cormorants have a relatively long nestling stage and are still at their nesting sites after the Eiders and Gulls have dispersed, it has usually been during this late nestling stage that Eagles have attacked Cormorant colonies. As a result there are now very few Great Cormorant youth coming up through the system. There are also several cohorts of young eagles broken in eating seabirds, some maybe many of these eagles will live a long time and they will not forget. These eagles like to attack Cormorant colonies in a pack. 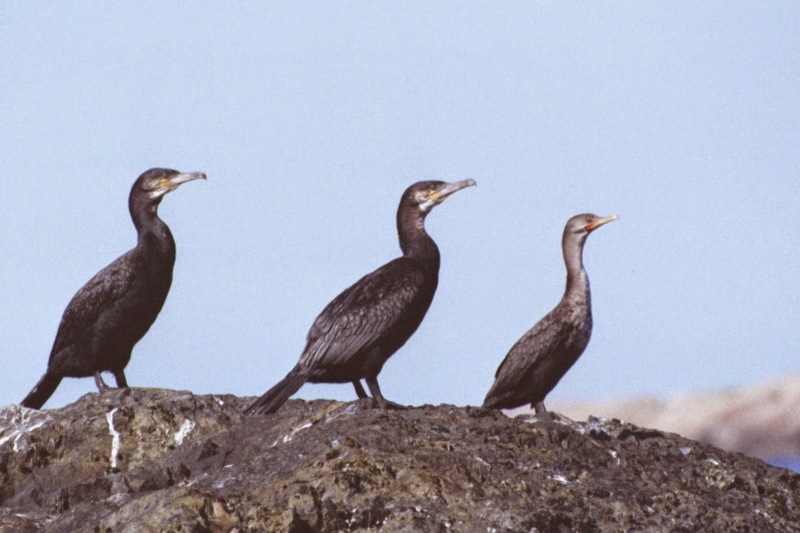 In June 2009, there were 3 clumps of Double-crested Cormorant nests on Southern Mark Island (about 5 acre). The clump on the eastern side included several Great Cormorant nests and about 120 Double-crest nests. On July 18 there were 8 eagles surrounding what was left of that clump, 30 or so nests, the other two clumps on the island were intact as of that date. Rather than a few eagles attacking each of the three nesting clumps all the eagles attacked the same clump, suggesting that a mass of determined cormorants intimidate a lone eagle. July 16 '09 Southern Mark. June 7 2012 there were 19 great cormorant nests and 34 Double-crested Cormorant nests on the Black Horse, by June 29 there were only 11 Great Cormorant nests left, all the others having been abandoned due to Eagles. Yet on the 15th of August there was one pair of Great Cormorant still defending their two chicks, one of the pair was on the nest while an adult and an immature Eagle sat within 12 feet. After having seen all their neighbors driven off or consumed by these same marauders, for years, this pair showed great courage and determination. (Photo). The last heroic Great Cormorant on The Black Horse, Aug.15, 2012, there was a young eagle behind the rock to the right of the adult and chick. note other abandoned nests one providing a roost for the eagle. Reports from Rand Dibblee indicate that the great cormorant population on Prince Edward Island has been greatly reduced by eagles during the last decade. Years ago, when it appeared that gulls might eliminate terns from our region, people began a program of keeping some Islands gull free “weeding” gulls off some islands to provide safe areas for terns to breed. Currently the Great Cormorant population is in need of similar protection. Vinalhaven Seal Island has a potentially guardable Great Cormorant population, if eagles were actively driven from the island during the extent of the Cormorant nesting season that small band, (18 nests June 10, 2013, over a third of the nations Great Cormorants supply), will more likely persist. It would be a shame to loose these birds. To date there has been no commitment from the US. Fish and wildlife Service or the National Audubon Society’s Maine seabird program, (who co-manage the island supposedly for the sake of threatened seabirds), to make an effort to protect this the most critically threatened seabird population on the coast of Maine during the last fifty years. Young eagle over the last two great Cormorant chicks on Little Roberts Island, July 19 2013, they were gone the next day. Adult eagle over empty cormorant nests Little Roberts' Island. Some photos from Sept 13, on Green's Island, posting on Dec, 8, it looks like its a long way off after being 12 degrees last night. not sure what that one was?